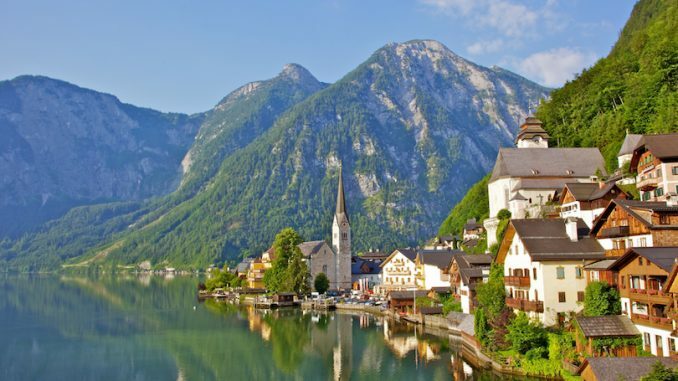 Austria travel attractions! Eisriesenwelt could easily be described as an amusement park for nature lovers. Home to a complex of underground ice caves, Eisriesenwelt offers dozens of miles of paths through stunning caverns. After climbing down more than 700 steps, the Eispalast emerges. This is an enormous palace made from ice, and when light hits its walls it sparkles beautifully. The nearest city to Eisriesenwelt is Werfen, where visitors can catch a round-trip shuttle that departs regularly from the city’s train station. One of the best places to ski in Austria, the famed resort town of Kitzbuhel spoils snow lovers with its 170 kilometers of skiable pistes and slopes dotted with little mountain huts, where they can stop for traditional Alpine snacks and warming drinks. Although it’s the site of the annual Hahnenkamm, the toughest of all downhill ski races, Kitzbuhel has plenty of terrain for all skill levels in its three skiing areas, and the smallest of these, Bichlalm, is dedicated to freeriders. But Kitzbuhel is not just for skiers. With its walls and frescoed houses, and snow-covered Alps for a backdrop, the town is as pretty as Alpine villages get.The 1,998-meter Kitzbuheler Horn that delights skiers in the winter is a favorite for mountain hikers in the summer, and you can also reach the summit by cable car via the Pletzeralm. It’s considered one of the finest summit views in the Tyrol: to the south from the Radstadter Tauern to the Otztal Alps; to the north, the nearby Kaisergebirge; to the west, the Lechtal Alps; and to the east, the Hochkonig. To the south of the Kitzbuheler Horn rises the 1,772-meter-high Hornkopfli, also reached by cableway. In addition to the great views, on the summit, you’ll find the Gipfelhaus, a unique mountaintop home; a chapel; a restaurant; and an Alpine garden. The Church of Maria Saal, perched on a hill high above the Zollfeld, is one of the leading places of pilgrimage in the state of Carinthia in southern Austria. It was here around 750 AD that Bishop Modestus consecrated a church from which the surrounding area was Christianized. The present twin-towered church was built in Gothic style in the first half of the 15th century on the foundations of a Roman basilica, and was remodeled during the Renaissance and Baroque periods. Highlights include the west facade with twin towers and its fine old gravestones. Particularly interesting are the 16th-century Keutschach Epitaph depicting the Coronation of Our Lady, and a Roman stone relief from around 300 AD. For our german language readers : Auf meinem Blog prasentiere ich euch in erster Linie tolle und sehr gunstige Reiseschnappchen. Egal, ob ihr nach einer Pauschalreise sucht oder nach gunstigen Flugen nach Thailand und auf unsere Lieblingsinsel Mallorca, ich finde immer ein gutes Angebot. Nach dem Motto „gunstig die Welt sehen“ versuche ich fur euch wirklich gunstige Reisen zu finden. Du hast eine Frage zu einem unserer Deals oder zu einer Buchung? Dann schreib uns einfach eine Nachricht an info@urlaubspanda.at. Wir antworten so schnell wie moglich! Stadtetrip und Stadtereisen. Situated near Germany’s southern border with Austria, the city of Salzburg, like its capital counterpart, is famous for its long-standing musical traditions, including being the birthplace of Wolfgang Mozart. Beyond the many examples of historic architecture and artistic attractions found in the city, Salzburg is surrounded by the breathtakingly epic Alps mountain range, affording visitors and residents alike the ability to explore the experiential contrast of rich history and stunning natural beauty simultaneously.